MamaC, your chiffon cake looks so gooood and on your first try too. Well done. Can you share what type of almonds you used for substitution and how much? Life is short so never pass an opportunity to taste new foods! :lol: :lol: Is it that bad? By the way, do they sell the real durian over there :roll: ? I am sorry; I didn't mention that is not your recipe I made... I am sure they are related on a whole part... there is only one way to make chiffon. And yes, was my first chiffon cake I ever done. The recipe I made I found somewhere on the internet... and if the bell rings right it may very well be Diana's. :lol: :lol: i too agree with angie ... i take my hat off you MamaC coz not many as brave as you ... many will be turned off by the smell and would never want to try it. Well, I have a principle, don't say "I don't like it" until you try it. Your chiffon cake loooks lovely. Very well done for 1st attemp. Speaking of chiffon cake, I baked it in that special chiffon pan (two pieces)... and tried to see if I use a bundt cake pan will work the same and it didn't. I saw many girls tried other types of pan. 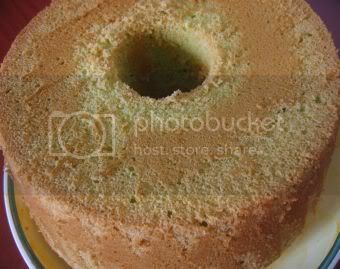 My bundt chiffon cake, came out in pieces and gave it to a friend... who didn't cake. But it was so nice and fluffy and so delicious smelling. Tried this recipe yesterday, the cake is great. Thanks for sharing this recipe. Long time did not "see" u. Glad to know you like it. Was busy for the past few weeks, just log in to "look see" only. Any idea what's the reasons. The first time I baked it sunk quite a lot as I followed instruction in the Alex's book to leave the cake cool completely then only remove the pan. The above cake I tried to lift up the cake pan with the help of satay stick. I still can't make a perfect chiffon cake :cry: . Unlike you gals have swee swee and even surface. Do you leave the pan while cooling the cake and how long did you take the pan out from the cake? 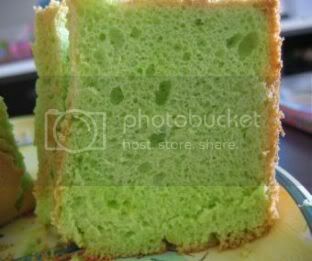 I refer to Alex Goh's pandan chiffon cake recipe to make this cake but adjust it for 5 eggs cos my tube pan is 22cm, perfer to have a higher cake. I remove the cake after half an hour out of the oven. It didn't shrink and it 'stand' till the next day. On top of Jo's point on the mixing,maybe the siffness of the beaten egg white plays a part in the shrinkage. Thanks karlskrona & Jennifer for your prompt replies. Appreciate it very much. Now that I compared my cake with Jennifer's picture, I notice that my cake is not as dry as Jennifer's. Maybe I should extend my baking time. I used 20cm pan and baked for 42 minutes. How long did you gals bake? Maybe your cake too dense?? For my oven, my cake takes about close to 60min to fully bake the cake. I always insert the skewer all the way to the bottom of the cake to check, when fully baked it will comes out clean. I always insert the skewer all the way to the bottom of the cake to check, when fully baked it will comes out clean. I did that too and it comes out clean, so thought it's ok liao. Will try again and bake for a longer time to see the results. Thanks ladies for sharing. Thanks so much to karlskrona and Jennifer for providing me with your experiences and pictures. My previous problem was I baked not long enough, hence the top collapsed. This time round, I baked for an hour and the cake stayed intact in the pan without falling down when cooling. Not forgetting to thank connie for the recipe, if not because of your recipe+pix and other forum-ers pix, I would not have the courage to try again. Thank you gals. You are most welcome. Your chiffon looks perfect & yummy! Glad: Beautiful chiffon! So light and the colour is amazing! How I wish that technology is advanced enough for me to smell and taste your cake! Keep up the great work! Thanks ladies. It's indeed very soft and light. Can eat a few slices at one go .